We’d love your help. Let us know what’s wrong with this preview of The Green Lantern Chronicles, Vol. 3 by John Broome. 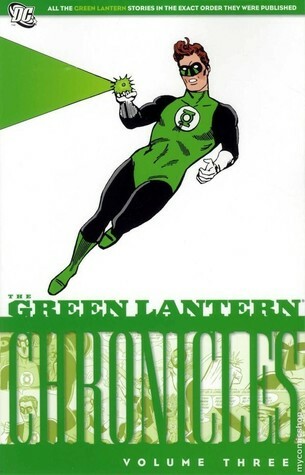 The 1960s adventures of Green Lantern continue in this new volume reprinting his stories in their original order of publication. Included are the Emerald Gladiator's confrontation with his new bosses the Guardians of Oa, an early team-up with fellow Silver Age icon Barry Allen (Flash), the origin of the Green Lantern oath and much much more! To ask other readers questions about The Green Lantern Chronicles, Vol. 3, please sign up. Yet another Silver Age collection to review! This has 2 to 3 issue arcs, which I haven't seen much in the Flash, Spider-Man, or Fantastic Four comics of the time. One weakness is that the Green Lantern didn't have many distinctive villains at the time compared to someone like the Flash. He's often facing common criminals or one-shot alien invaders, although Sinestro appears and Sonar makes his debut. For all people accuse Hal Jordan of being uncreative, he uses his power in a variety of ways: water Yet another Silver Age collection to review! For all people accuse Hal Jordan of being uncreative, he uses his power in a variety of ways: waterspout, boxing gloves, handcuffs, dissolving bullets, mattresses, a bubble shield, and many more. Of course this level of power requires contrivances such as illusions of yellow or misplacing the ring somehow. Flash fans may want to check this out for the crossovers. I wonder how writers keep the DC/Marvel universes consistent, especially when they have to account for a wide variety of heroes. What was Superman doing when the Myrmitons (NOT Myrmidons of Greek mythology) invaded? Carol Ferris, donning apron: Terga and I will wash--but you two will dry! Fair enough? Hal Jordan: It's a deal, Carol! That dinner was worth it! Hal: Pie, you're a lucky man--to have a wife like Terga! Pieface: That's what you need, Hal--a wife! If you had one you wouldn't have buttons hanging by a thread! Pieface: Your wife would darn and sew for you--take care of you! This was a fun, fun, fun revisit to the adventures of one of my childhood heroes. These stories, mostly by Garner Fox and Gil Kane are imaginative, colorful, and slightly more demanding on the brain than you might expect given that they were created for reading children 12 and under. Notice Carmine Infantino's designs in the final story. See The Green Lantern Chronicles Vol 1.